Los Angeles' very own extreme metal quintet Dia De Los Muertos released their new album today. It's "metal to the masses" as drummer Alfonso Pinzon has called it, as the entire album is available for free download on the band's official website. After the self-titled EP which was released in 2005, this one has taken a while, but with a group of inspired musicians along with Roy Z in charge of the mixing, I expected it to be well worth the wait. With "Las Calaveras Del Terror", the album hits you in the face right from the get-go. Besides the elements of speed and aggression, it features some very nicely crafted guitar riffs that give the song depth. While this is just about the perfect start this album could have hoped to get, "Plague Mass" takes it up a notch further as it's a track that's faster, heavier and musically even richer than its predecessor. It's quite befitting that it's titled Plague Mass because it certainly has the potential to spread among the death metal masses like a plague. "Sigo Siendo El Rey" is just a short burst of brutality that features Tony Campos from Asesino, and leads into "Death's Embrace". This one starts out slow and goes through a couple of tempo changes. It's the darkest sounding tune on the album and should make a great addition to their live set. Next up is "Meat For The Grinder" featuring two legendary musicians, Jeff Walker of Carcass and Brujeria fame, and Scott Carlson from Repulsion. This is a track about which nothing bad can possibly be thought of or said, and it should be in heavy rotation among listeners. It sounds very much like a tune written with Jeff Walker in mind, and rightly forms the centerpiece of the album. "Here Hell Rises" presents yet more of the death metal goodness with some crushing vocals by Loana dP Valencia at the forefront, complemented excellently by her band mates who gel together to create a distinctly tight sound. There is absolutely no respite for the listener who by this time is at the mercy of this album as it goes into ear-crushing offerings like "The Fifth Republic", "Bestia De Las Mil Cabezas", and "Sigo Vivo", followed by a beautifully composed instrumental to bring an end to a glorious album. Adding to the power of the music are the guest spots by some seasoned musicians that are renowned in the realms of Los Angeles and/or Latin American metal. This is every bit as good as I had expected it to be, and then some. It presents everything that's good about extreme metal, but with a very unique Latin American flavor. The kinship among the five band members can definitely be felt while listening to the music, as it sounds uncannily cohesive. This 10-song composition is near-perfect, and one that should gratify all extreme metal fans. 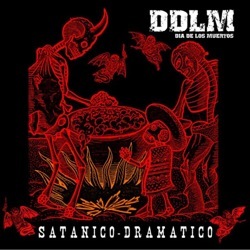 "Satanico Dramatico" is a stellar effort that not only does Los Angeles and Latin American metal communities proud, but through its free downloadable release, truly represents what metal stands for, which is to deliver good music solely to fulfill a burning passion inside musicians and fans alike. A brutally intense, ear-shattering, neck-snapping collection of tunes.